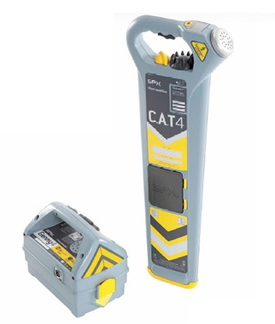 The C.A.T4™ and Genny4™ product range showcases the latest technology of the highly popular Cable Avoidance Tools and Signal Generators. Pioneered by Radiodetection, the systems enable operators to work more efficiently, and can manage the safety requirements of the C.A.T4 and Genny4 fleet more effectively. The new C.A.T4 digital platform is designed to help the operator locate more buried utilities through highly refined locate capabilities. The C.A.T4 Avoidance Mode™ provides the ability for the operator check an intended excavation area for Power, Radio and Genny signals, and pinpoint located utilities in a single scan. Features such as the bargraph ‘tidemark’ enable an operator to quickly spot a peak response and zero-in on a buried conductor. Service Due indicator and CALSafe™Minimise the risk of having to delay a survey because a C.A.T4’s calibration has expired. eC.A.T4 series products provide a 30 days countdown warning to the expiry of the calibration certificate. The optional CALSafe can be set to prevent the unit from operating outside the calibration period, ensuring compliance with company policies – and the interval required between services can be customised within a 1 year period using the C.A.T Manager software. C.A.T Manager™ SoftwareC.A.T4 locators are supported with the dedicated C.A.T Manager software package. This Windows® PC program allows plant, fleet and site managers to minimise down time by performing software upgrades, sending a service request or reproducing calibration certificates. C.A.T4 Software Updater C.A.T4 locators software can be updated to the latest release by using the C.A.T4 Software Updater. This Windows® PC program allows users that have no access to the C.A.T Manager software package to perform software upgrades of their C.A.T4 or eC.A.T4 locators. Software upgrades are free of charge.